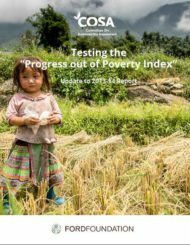 The Committee on Sustainability Assessment (COSA) has released a synthesis of its review of poverty assessment tools including those of IFAD, CGAP, IRIS/USAID, the Oxford Multidimensional Poverty Index, and Grameen’s Progress out of Poverty Index (PPI). The PPI was pilot tested in 4 programs with nearly 2500 farm households as part of COSA’s interest in a practical and widely-applicable poverty assessment tool that could complement its own suite of assessment tools for producers in developing countries. COSA began looking for an complementary approach to assessing poverty. With support from the Ford Foundation, COSA evaluated a number of poverty measurement tools that could be integrated into its surveys and then correlated outcomes with more traditional measures of financial well-being. Because of the PPI’s transparency, wide acceptance, and ability to relate financial condition to national and global poverty line, COSA decided to pilot the PPI.